Underwriting Flood Insurance is complex enough. Keeping out of E&O trouble when working with Flood Insurance is just as complex and takes some planning to avoid. Over the past few years, heavy flooding across the US has brought out all types of Flood Insurance related E&O claims against Agents. The main thing to remember is that after a flood if your Client believes that any Flood coverage or the discussion of Flood coverage was inadequate, missing, or denied, you will be the first party they turn to for recovery of any monetary difference. Are you ready? 1. Always ask a Client buying Homeowners, Commercial or other property insurance if they want a Flood Insurance quote? 2. 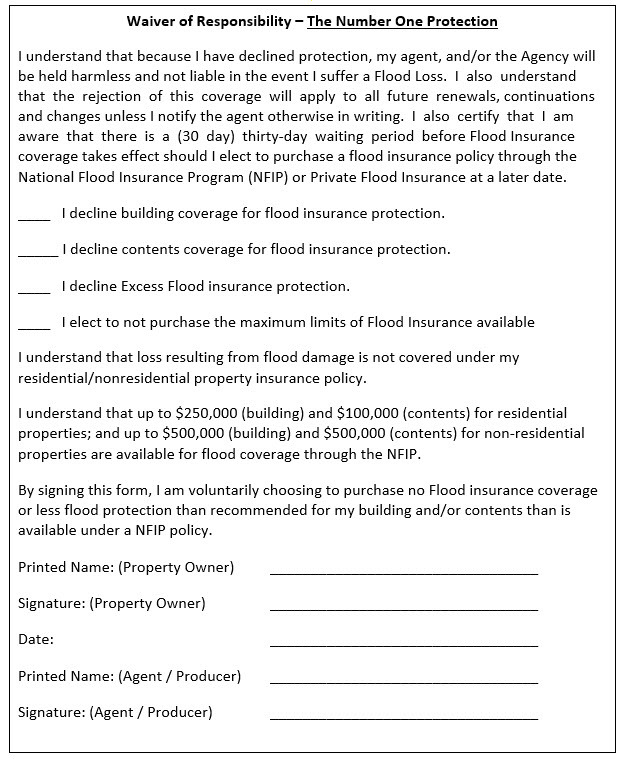 Ask a Client who declines Flood Insurance to sign a waiver similar to or stronger than the one shown below? 3. Always recommend that a Client, who wants Flood Building coverage also buy Contents Coverage to protect what is inside of their building? 4. Double check the Flood Zone Determination and other property information through public property records? 5. Keep up weekly or monthly with the FEMA rule and rate changes and local Flood Map changes? "For the most part, the types of allegations and claims that surface after a Flood catastrophe are failure to procure a certain kind of coverage, failure to place coverage at all, failure to obtain adequate limits, or failure to advise certain coverage was necessary." 6. Offer Private Flood Insurance, which is accepted by most Lenders and usually has lower premiums with the same or better coverages than the National Flood Insurance Program (NFIP) policies? 7. Have large commercial risks needing Flood Insurance for Scheduled Buildings, Business Income Loss or Replacement Cost? America's Flood does all of these for you and more. Flood Insurance is our only business, and using us might keep you out of trouble. We specialize in tough NFIP or Private Flood placements and loan closings, so try us out. 800-333-0883 (Commissions paid to licensed Agents). Nearly all properties in the US are assigned a Flood Zone, and Flood Zone Determinations (FZD) are used to identify if a building is in or out of the highest risk Special Flood Hazard Area (SFHA - begins with A or V.) Mortgage Lenders must require borrowers to maintain Flood Insurance on any property in a SFHA. However, probably the greatest Flood E&O risks for Agents come from properties located in "Medium" Flood Risk Zones B, C and X. Mortgage Lenders do not require Flood Insurance in these areas and most people are not aware of their Flood risk. Nearly 25% of all Flood Claims come from properties located in the "Medium" Flood risk zones. Don't be caught unaware. All Clients need to be asked to get a Flood Insurance quote, even if they are on a mountain (where Mudslide is covered by Flood policies) and/or sign a waiver as shown below. Stay safe. Provide a Flood quote or get your waiver signed! Nearly 25% of all Flood Claims come from properties located in the "Medium" risk zones. Failure to process applications in an accurate and timely manner, esp. if evidence of Insurance was provided at close of escrow before premium was paid and submitted. An Agent cannot "bind" Flood insurance. Failure to offer Flood Insurance by telling the Client "they don't need it". Failure to procure the coverage requested by the Client. Failure to adequately identify exposures including advising the customer of any coverage gaps, limitations, or restrictions. Misrepresenting coverage being available for excluded items like decks, pools, landscaping and other items which might be covered in a Homeowners, but not a Flood policy. Failure to obtain, add or accurately identify additional insureds or loss payees. Failure to advise the Client of waiting periods and exactly when coverage will go into effect. Failure to adequately explain policy provisions or misleading an insured to believe coverage will be provided when it will not. Intentionally changing the Flood Zone or other data to get a lower quote for the Client. Failure to report a claim in a timely and accurate manner. Historically contacting a customer to advise payment needed to renew a policy and then failing to do so and a claim occurs after cancellation. Historically contacting a customer to advise of a cancellation or nonrenewal on policies and then failing to do so and a claim occurs after cancellation or nonrenewal (esp. with Private). Become familiar with the complex underwriting guidelines issued by the NFIP and Private Carriers or use experts like America's Flood. Establish and enforce specific procedures for Flood Insurance, including gathering underwriting data, double checks for accuracy, customer disclosures, quick transfer of money, applications and endorsements, and a final check on all applications, endorsements and cancellations before being submitted. Use a Flood Insurance check list to be sure you are asking all the right questions and informing the Client properly. We can send you our form upon request. Always ask a Client if they would like a Flood quote and get the waiver signed if they decline it - on every quote. If the Client wants Flood Insurance, always provide a Contents quote. Get Applications and Premium payment immediately to the carrier or America's Flood. We do it all electronically for speed and accuracy. Alert the Client to any waiting period and exactly when coverage will begin. Know the coverages and exclusions in the Flood policy and go over them with your Client. Know the Flood Zone of the structure so that you choose the appropriate Flood policy and coverages. If a Lender requires the Flood policy, use a copy of their Flood Determination. Check to see if the Flood Insurance coverage for the building was "grandfathered" after a FEMA Flood Map change. Document, Document, Document: Maintain notes, check lists, emails and documents which can show in a court of law exactly what was said and what occurred on any particular Flood policy. Follow up on renewals. Update coverages if needed. Provide a Private Flood quote if the Client resists the NFIP renewal pricing. Maintain your Flood policies and keep the rest of your Client policies intact as well. When using Americas Flood, we notify you in advance of Flood Renewals coming up and can provide you a Private Flood Insurance quote to offer your Client, which is usually less expensive than the renewing NFIP policy. We Agents operate in a very litigious society. It will be impossible to completely eradicate E&O claims by Clients who experience a Flood loss, then feel they were not given the insurance coverage or the proper information expected from the Agent. But, the fact that a claim is made does not necessarily mean that there is liability on the part of the Agent, as there are often viable defenses to such claims, especially if you follow best practices for Flood Insurance. The key is to establish clear written (and enforced) procedures for processing, placing and tracking Flood Insurance business and to document what went on in each policy transaction carefully. That's why over 700 Agencies nationwide rely on America's Flood to accurately manage their Flood policies. Call with a question or quote anytime. We answer our phones.